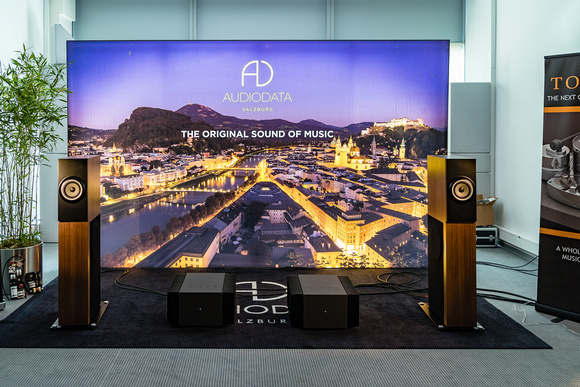 Here is the good news about the annual Munich High End trade show: If you go, you’ll get the chance to hear speakers and electronics and sources you won’t hear anywhere else, at prices that range from affordable to sky’s-the-limit—plus you’ll get to eat schnitzel and spargel in the bargain. Now here is the bad news: Though most offerings at the MOC (the convention center where the show is held) were pleasant enough, the sound was rarely great, by which I mean I was seldom fooled into thinking I was hearing a real voice or trumpet or piano when I was listening to my own LPs. Of course, the absolute sound is hard to replicate under any circumstance, much more under show conditions. It can be done, but it takes luck as well as skill. So…let’s start with the lucky ones. What sounded “best” (meaning the most like the real thing) in Muenchen? Those of you who have read my Munich High End reports in the past, may be able to guess. 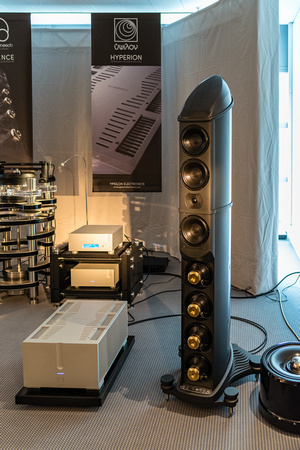 Once again, it was the horn-loaded Living Voice Vox Palladian with outboard Palladian Basso subwoofer (a mere €500k the pair), driven this year by Engström’s Monica line preamp and Lars mono power amplifiers and sourced by a Kuzma-M turntable with a Stogi S VTA tonearm, Fuuga cartridge, and an SJS Model 3 phonostage. As I said in 2016, “I don't know how LV accomplishes it but the Palladian/Basso cuts the Gordian knot that ties up almost every other horn speaker: It generates phenomenal low bass (and I mean really low) from exponential-horn-loaded 13" cones and yet somehow manages to mate those cones seamlessly with the Vitavox dynamic and Vitavox and TAD compression drivers used in the Palladian’s bass, mid/bass, midrange, and treble horns.” Though I thought the system was overly bright on digital sources, on analog ones, such as my Satchmo LP, it was incredibly neutral and alive on voice, trumpet, piano, clarinet, and trombone, with none of the darkening of timbre in the lower mids or brightening of timbre in the top treble that I heard on virtually everything else at Munich High End. Same story with my Chet Baker Sings LP, making for the most lifelike presentation of the show—a sound that was more real because more neutral and present and paradoxically (given the complexity of the Palladian/Basso) less speaker-like than the competition. Having said this, I’m not sure the Engström electronics were the equals of the Kondo gear that Living Voice generally shows with (and did show with in a separate all-digital room), thus the hardness and brightness and lack of pliancy on digital sources. But considering the Engström’s price ($30k) and the results on analog, what’s to complain about? Had it not been for the Vox Palladian/Basso, one of my next two “top picks” would have been awarded best of show. Oddly enough (or not), both have been previous BOS winners at Munich. The first is Zellaton’s three-way, five-driver (1.6" full-cone tweeter, two 7" full-cone mid/woofs, and two 11" full-cone woofers) $375k Statement speaker, driven by YS Sound preamplifiers and amplifiers coupled with a Soulution 755 phonostage, sourced by a Reed 3C turntable and ’arm with Audio Technica AT-ART1000 cartridge, and Schnerzinger wiring and Giga Protection. On my Satchmo LP, the soft voices on the opening chorus of “St. James Infirmary” were so realistically reproduced I thought someone sitting next to me was whispering in my ear. Louis’ vocal was also quite natural, though not as scary-real as those opening choristers. The system was superb on clarinet and trumpet, though it did not have quite enough power-range oomph on trombone, drumkit, and bass. This absence of power was most obvious on my Wilson recording of the Debussy violin sonata, where the piano didn’t sound as full and hard-hitting as I know it should have been. This may have been due in part to the fact that the playback level was consistently on the low side; plus, I’m not sure I loved the YS preamps and amps, which were a little bright and mechanical compared to what I’ve heard from previous Zellaton setups. My next top pick is a little like a cross between the Living Voices and the Zellatons: Magico’s $172k, three-way, five-driver (one 28mm diamond-coated-beryllium tweeter, one 6" graphene-carbon midrange, and three 10.5" nano-graphene woofers) M6, which those of you who read TAS will already know I consider the best loudspeaker Alon Wolf has yet made. Along with its little brother, the M3, it is certainly the most “invisible” Magico ever, thanks in large part to its superb aerodynamic carbon-fiber-and-aluminum chassis. Driven by Soulution 7 Series electronics and sourced by a Kronos Pro turntable (ZYX cartridge) and Aurender N10 server with MIT and Vovox cabling, the M6s had the hard-hitting power that the Zellatons lacked, obvious on the trombone and drumkit of my Satchmo LP, though in this setup it didn’t have quite the same breathiness and delicacy of detail on Stachmo’s voice that the Zells had; it also had much the same superb blend of drivers and effortless power that made the Living Voices so beguiling, though it didn’t have quite the same neutrality and you-are-there immediacy on Chet Baker’s vocals and trumpet that the horn speakers had (it also didn’t have the piercing brightness on digital sources of the Living Voice system). Probably the best all-around transducer I heard in Munich, the M6 was just a bit bottom-up in balance (typical of Soulution electronics) and a little less finely detailed and present than I know it is capable of sounding. 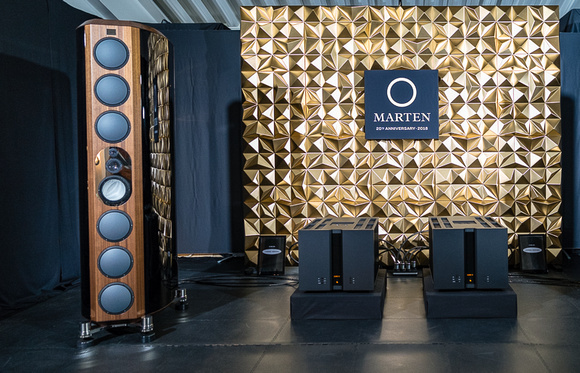 Swedish manufacturer Marten demo’d several speakers at Munich, but I was smitten by its giant three-way, ten-driver (four 9" ceramic woofers, four 9" aluminum passive radiators, one 7" ceramic midrange, and 1" diamond tweeter), wood-and-carbon-fiber-enclosed Coltrane Momento 2 (€310k), driven by Vitus electronics. In spite of its gargantuan dimensions (15.4" x 65.4" x 23.6"), the Coltrane Momento 2 was neutral, 3-D, spacious, alive, and astonishingly of a piece from top to bottom—excellent on digital and on an R2R recording of a jazz trio (where it was superb on bass, drum, and ride cymbal), and among the best I heard on my Stachmo and Chet Baker LPs. Oh, the low end might have been a bit overdamped, and the room was adding a touch of brightness to the topmost treble; still, the Coltrane Momento 2’s sound was so tight and coherent it was like listening to a two-way the size of the Ritz. 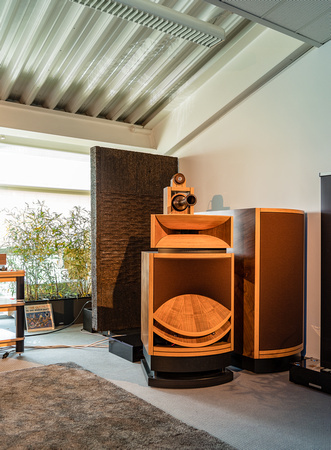 Speaking of two-ways, though not in my price category the Wolf von Langa Son ribbon-and-12"-field-coil-cone two-way (a “mere” €9.8k), driven by Air Tight electronics (including the superb 3211 amp and new 3011 phonostage), was simply too good to ignore. Extremely neutral and immediate, the system produced one of the most natural sounds I heard on my Chet Baker LP. Despite some heaviness in the bass it was also superb on Satchmo and on a Rickie Lee Jones LP—just plain realistic in the midband, with terrific dynamics low-level and high. I’ve liked Wolf van Langa’s speakers in the past, but this little number really grabbed me. It was by far the Best of Show combo for the money, and in spite of its diminutive size it didn’t sound a bit miniaturized! Estelon showed its uniquely adjustable, four-way, five-driver (two 10" aluminum dome woofers, one 10" aluminum dome mid/woofer; one 7" ceramic inverted dome midrange; and one 1.5" diamond inverted dome tweeter) Extreme (€200k) driven by Vitus electronics with a digital-only source. Despite the plethora of ones and zeroes, the system was gorgeous from the very first cut, with extremely smooth, even, extended, and natural frequency response, and unusually good dynamic range. This was easily heard on a female vocal, where there was no compression on fortissimos and yet none of the usual dynamic stress and strain that comes on uncompressed “big” moments. On a piano concerto, piano and string tone were also gorgeous and, as with the female voice, the piano showed no stress and subsequent sharpening of timbre and texture in its upper octaves on fortissimos. Although I wish I could’ve heard the Extreme with an analog source, this was still a superb presentation, and had I not sneaked in the von Langa two-way the Extreme would’ve been my fifth contender for Best of Show. 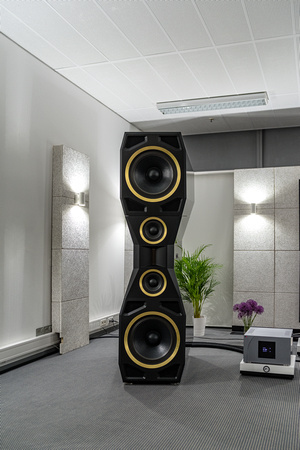 At Munich High End, the svelte, three-way, four-driver (coax beryllium/magnesium tweeter/midrange, with two 220mm carbon-fiber woofers) Audiodata Art One Passive (€30k) floorstander has impressed me in years past, and did so again in 2018. Driven by Block Audio monoblocks and sourced by a Ton Art turntable, the Art Ones sounded very very nice on my Chet Baker LP, with excellent driver integration, lovely top-to-bottom balance, good body on piano and voice, and none of the grain or excess aggressiveness at loud levels I heard from speakers in other rooms. This is a wonderful transducer, and it is a mystery to me why it isn’t more widely distributed. 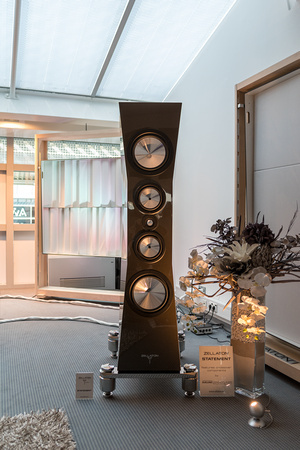 The three-way, five-driver (two 10" carbon-fiber-sandwich-composite woofers, two 6” carbon-fiber-sandwich-composite midranges, and one waveguide-mounted 1" beryllium dome tweeter) Rockport Lyra ($170k) in its unique, elaborately damped, dual-housing “DAMNSTIF” enclosure was shown with Soulution 5 Series electronics sourced by a DeBaer turntable on CMS racks with Vovox cables. Very neutral and natural on voices (and everything else), it shined on my Chet Baker and Louis Armstrong LPs—superb on trumpet and good on standup bass. 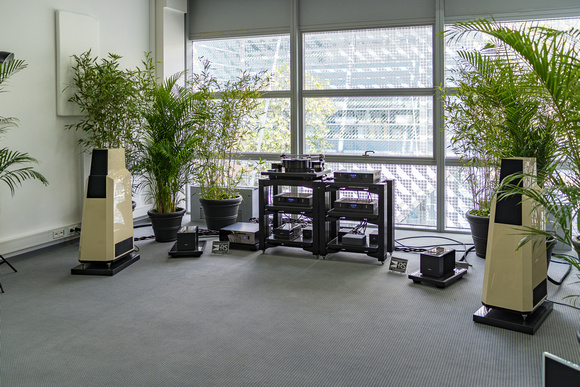 In a different room, the Lyra was also shown with Absolare's new Passion hybrid tube/solid-state amplifier and a Kronos turntable, where it sounded sweeter and denser in color at some cost in resolution. Vandersteen, which never seems to have a bad show, continued its winning streak with the four-way, six-driver (one 0.75" rear-firing dome tweeter, one front-firing 1" carbon-fiber/balsawood-sandwich dome tweeter,one 4.5" fiber/balsawood-sandwich midrange, one 7" fiber/balsawood-sandwich mid/woofer, and two 12" powered aluminum subwoofers) Model Seven Mk.II ($62k), driven by Brinkmann’s Marconi Mk II preamplifier and Edison Mk II phonostage, sourced by a Brinkmann 33 1/3 Anniversary Balance turntable and Brinkmann Nyquist Mk II tube-hybrid DAC with Harmonic Resolution Systems VXR Reference isolation stands and bases and system cabling and power conditioning by AudioQuest. A little bright but quite present on digital, the Vandies were superb on my Louis Armstrong LP, particularly on Satchmo’s voice and the brasses and winds, and damn close to great on Chet Baker, where you could really hear the warmth of the RCA ribbon mikes used to make this recording. I chalked up a bit of heaviness in the bass to the room. The six-and-a-half-foot tall, three-thousand-five-hundred pound, four-chassis, thirteen-driver-per-side (two radial TT100 woofers, two radial MT50/E midrange, two HT37/E radial tweeters, one “ambience” dome tweeter, and six 12"aluminum cone subwoofers in a separate column) MBL X-Tremes (€200k), driven by MBL 9011 amps and 6010 D preamplifier and sourced by an MBL DAC (only), were, as usual, simply superb—very airy and spacious and alive, without a trace of box sound and, despite the four chassis and omnidirectional radiation-pattern of the drivers, possessed of excellent imaging. Of late, MBL has taken to showing this Goliath with a real musician (a cellist), who plays live and then compares what he has played to digital recordings of same (engineered by MBL’s genius-designer Jürgen Reis). It takes confidence to do this—and a great loudspeaker. MBL has both. Had I been able to listen to my own LPs on the X-Tremes, I imagine they, too, would have made it into my Top Five—they’re that good. Holger Stein, author of the highly effective Harmonizer room treatments, doesn’t just make gizmos. Among many other things, he also makes loudspeakers, including Stein Music’s €128k Top Line Bob-XL—an odd-looking duck if I’ve ever seen one, with God knows how many drivers (two of them horn-loaded) on three sides of its huge main columns, and two more powered subwoofer columns with eight 18" drivers per unit. In spite of their unconventional mixture of drivers and unfathomable radiation patterns, the Bobs sounded great driven by Stein Music State Line and High Line electronics—much more neutral (i.e., much less dark or bright or both) than anything I’d recently heard at the show, with genuine warmth and sweetness on trumpet but no loss of energy. Satchmo sounded a little different in timbre than I’m used to, but his voice was still extremely detailed, and there was real body on clarinet and trombone. As was the case with the Vandersteens you could easily hear the warmth of the RCA ribbon mikes on my Chet Baker LP on both voice and trumpet. The Bob may have looked weird, but it sure didn’t sound that way. 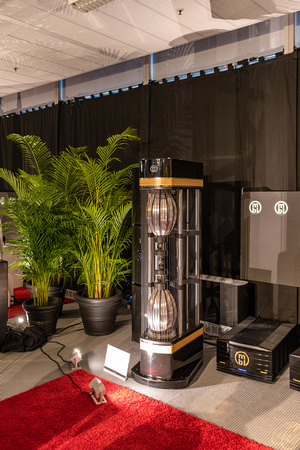 German speaker-maker Goebel debuted its giant new flagship, the Divin Majestic (€400k) driven by CH Precision electronics and sourced by a Kronos turntable. Interestingly, this incredibly big number doesn’t use the bending-wave driver that Goebel is famous for; instead it employs an air-motion transformer wedged, WMTMW style, between two pairs of mids and woofers. Be that as it may, the sound was kinda great, with terrific transient response and resolution, almost hornlike projection of images, tremendous weight and density of tone color, and superb dynamics. Resolution was so fine that I could hear the echo added to Deano’s voice (which is a first). Though the speaker was too bottom-up in balance to sound fully realistic, it was pretty damn remarkable, nonetheless. Goebel also showed its far less expensive Epoque Aeon Reference, this one with bending-wave driver, driven by Vitus Masterpiece series phonostage, amp, linestage, etc. wired with Purist Audio cables and sourced by a Hartvig turntable. The system was simply lovely sounding, with dark but beautiful timbre and exceptional detail without a trace of the analytical. Despite a bottom-up balance, the Epoque Reference was wonderful on voice with natural presence and superb resolution and expressiveness. In another field, these Goebels would also have been contenders for Best of Show. Tidal introduced its new “budget”-line three-way, five-driver (one 30mm Accuton cell ceramic tweeter, one 168mm Accuton cell ceramic midrange woofer, and three 190mm Accuton cell woofers) Vimberg Tonda (€28k) driven by Tidal electronics. The system was digital only and slightly lighter in balance than the Akira, upon which the Tonda is said to be based. Nonetheless, it was very pleasant—fast without bite, and full without bloat. Nice speaker. 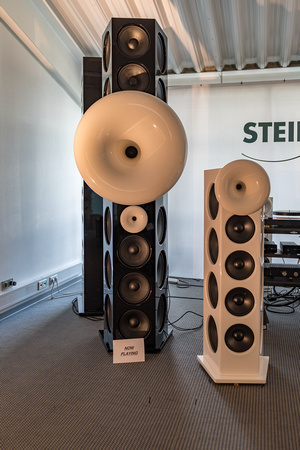 Stellar Swiss speaker-maker Stenheim debuted one of its huge new flagships with subs, the Reference Infinite ($340k), driven by CH Precision electronics and sourced by TechDAS turntables. On Kind of Blue, the big Stenheims had plenty of bite on trumpet (bite on Trane’s and Adderley’s saxes too) with nice standup bass and piano timbre. 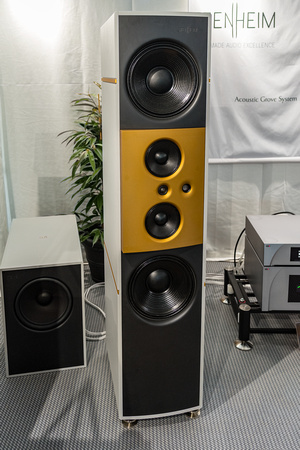 Unlike the Estelons, the Reference Infinites did turn a bit sharper on fortissimos—a touch of stress and edginess—but for the most part they were still extremely beautiful sounding transducers, with superbly defined bottom octaves. 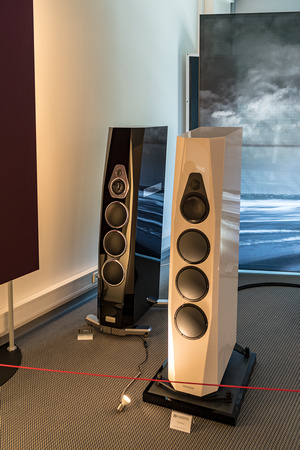 Despite their darker palette, the Reference Infinites recovered a very high level of detail with considerable air around vocalists and instrumentalists. The augmented single-driver Voxativ 9.87 ($29.9k) produced the best sound I’ve heard from Holger Adler’s speakers at a trade show. Driven by 805-based Voxativ electronics the 9.87s were absolutely lovely and lifelike, dark in balance but with a natural presence and dynamic liveliness on male and female vocals and instruments that made for a presentation not dissimilar from the Absolare/Rockport system, only a bit brighter and higher in energy. Once again, this was a system that could have been a Best of Show contender. 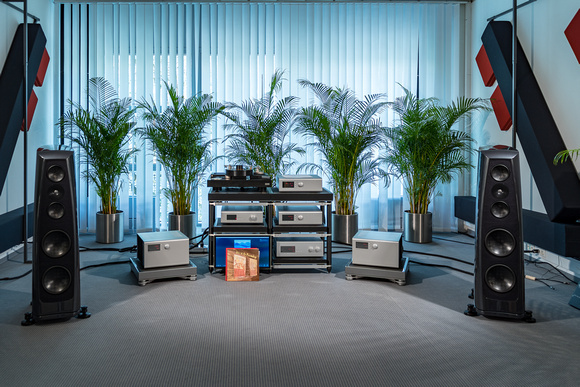 Constellation Audio showed its Centaur 2 mono amps and Perseus phonostage and Virgo III linestage with Wilson Audio’s three-way, four-driver Alexia Series-2 loudspeakers ($60k), sourced by a Continuum Obsidian turntable with Viper tonearm and Ortofon A95 cartridge and cabled by Transparent Audio. On my Chet Baker and Dean Martin LPs, voices were a little dark in timbre but otherwise nicely detailed and focused; there was also a little upper-treble emphasis on ride cymbal and trumpet, and piano and standup bass lacked a bit of body—not a bad presentation, just a little lean, a bit spotty, and not quite as real or gemütlich or as deep in soundstaging as I’m used to. Later in the week I heard a couple of Peter McGrath’s digital recordings where the system showed better, particularly on a piano quartet, which was really beautiful (though still darkish in timbre) and quite realistic. The three-way, four-driver Kaiser Kawero! (€60-90k), driven by Kondo electronics and sourced by a Kondo turntable (with SME ’arm and Kondo cartridge), had a lithe, lively sound on my Satchmo and Chet Baker LPs—very snappy (almost horn-like) on trumpet transients and excellent on voice! An outstanding speaker. Von Schwiekert Audio’s mammoth flagship, the multi-way twelve-driver (two 1000-watt-powered 15" sealed subwoofers, four 9" reinforced ceramic mid/bass drivers, two 7" reinforced ceramic midranges, two beryllium tweeters, and two 5" aluminum ribbon super tweeters, one rear-firing) Ultra 11 ($295k) driven by VAC electronics and sourced by the fabulous Acoustic Signature Invictus turntable sounded just a mite heavy in the bass but otherwise quite rich, dark, and beautiful. Terrific on trumpet, trombone, clarinet, ride, and piano on my Stachmo disc, it was too big and boomy on bass fiddle and drum. Ditto on my Chet Baker LP: great on trumpet and voice, too heavy on bass. Paradigm Personas ($39k) driven by Pass Labs electronics and sourced by dCS were pleasant enough but nothing special. Not much stage depth though the balance was pleasant. Everything was too upfront. The four-way spherical-horn-loaded Avantgarde Trios (€108k) coupled with six basshorns (€35k/pair) and driven by Avantgarde’s own electronics were very low in cupped hands coloration, quite immediate, clean, and fast, but a bit bright—just a little too much zip in this setup. Kharma’s four-way, five-driver (one 1" diamond concave tweeter, one 2" diamond concave tweeter, one 7" Omega-F midrange, and two 11" Omega-F woofer) Enigma Veyron EV-4D(€200k) was hooked to Enigma Veyron amps and cables and sourced by a Clearaudio Statement turntable. Dark but not savagely aggressive on the Buena Vista Social Club’s “Chan Chan,” the Veryrons had deep well defined bass and powerful midbass. On my Stachmo disc, they were excellent on voice but a bit too bright and aggressive on trumpet and winds. Verity Audio’s three-way, three-driver (one aluminum-foil ribbon tweeter, one 6" midrange, one 11" woofer) Sarastro IIS driven by Audia Flight in a digital-only room was, yet again, a little dark in balance, with bass that was fairly well defined despite a small amount of room boom. Though it had good presence on a French Canadian female vocalist it was a little forward and aggressive on fortes. Arcadian Audio (€105k) presented an unusual horn system, which sound a bit bright and hard, up close at least. The Audiovector R 8 with sub (€55k) had a tweet that added a bit too much brightness. The Raidho D-4.8 was smoother and more listenable than the previous two despite a bit of darkness in timbre and a slight edge from tweeter. And the two-way Crystal Cable Minissimo with Crystal amp and cable was quite good, though as it was being used without its subwoofer it lacked low bass. Louis sounded a little lighter in timbre than I’m used to on the Minissimo, but the trumpet and piano were fine, and the system really shined on my Chet Baker LP. Finally, the Lansche Audio 7.2 (€55k) with EMM Labs electronics and source had a really excellent bottom octave on digital recordings, with superb definition, extension, and color. 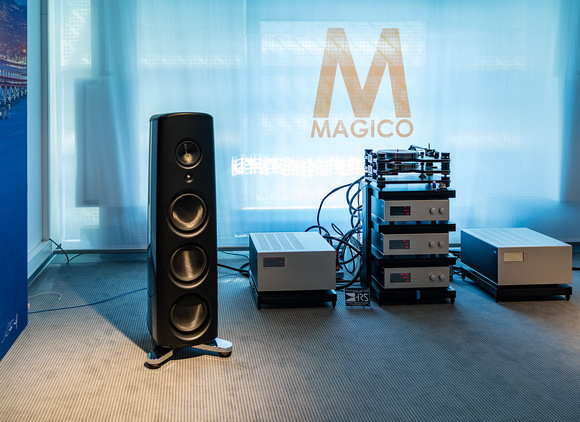 The Living Voice Vox Palladian/Basso, with the Magico M6 and Zellaton Statement nipping at its heels (and the Marten, Göbel, Estelon, Vandersteen, Voxativ, and MBL nipping at theirs). Wolf von Langa Son driven by Air Tight.